Let me start with a little introduction. We, Ed and Patti, decided to leave the city life & move to the "Farm". We sold our home in town and bought a 47 acre farm. Even before we decided to sell our home and move we had been looking for land to buy. At the time it was mostly just a dream. We found a small ad, 4-5 lines in the paper one day for some land on the Yellowstone River. They wanted a lot more than we were able to pay but we went to look at it anyway. FELL IN LOVE! The new house is going to be just about in middle of the property. 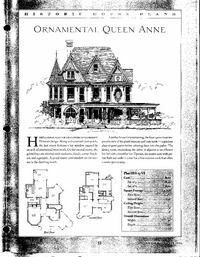 Ed found the house plan in one of his remodeling magazines many years ago. He did some modifications to the original plan. Mainly, added 2 feet to the parlor and 6 feet to the kitchen. We also reworked the plan to include an elevator (Ed and I plan to get old in this house). When all was said & done we did a mirror image of the plan to get it fit better on our site. When we sold our old home the market was a lot better than we expected and we came away with a hefty amount. We found the ad (buried deep in one of my files) and called the people. We worked a deal and in July 2000 we purchased the 47 acre farm along the Yellowstone River. We bought an old decrepit mobile home and moved it on site. We fixed up the trailer (But that's a whole different story) and moved in. Then we began the job of cleaning up about 30 years of neglect on both the buildings and the property itself. (Hence the name "Neverdone") Ed and I figure that we will never run out of projects to do here. The most useable building is probably the one we find most offensive. The "Yellow Barn" is where we are currently parking our vehicles. Whoever built this barn had no design sense at all. The barn is built on the far north side of the yard so it blocks the view towards the river and woods. Here in Montana any trees are a blessing and to mar the view with this building is totally unacceptable. The "Yellow Barn' Hopes to grow and become a Carriage House on the South side of the yard near the kitchen. That may be next years project. 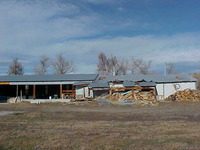 The barns are all eventually going to be torn down (if they don't fall down first, notice the roof on the right side. The wind decided to pick this roof up and move it. By the end of the year the roof was rolled half way back) and be rebuilt to more pleasing space. We have great plans for a barn similar to some that you see in the Midwest. We really like the old barns in Wisconsin. What used to be the milk barn here will be turned into a wood shop for Ed. The basic building (The part on the left) is 30x50 and Ed hopes to get it looking like an old time railroad station.